Congratulations to "Jonetta", the winner in Wendy's giveaway. Thank you to all who participated! 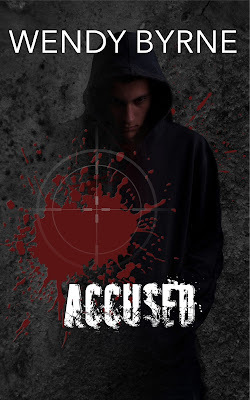 When I started to write Accused I thought about myself as a parent, all the worries I had while my boys were growing up, sometimes about mundane everyday things, sometimes just because my mind takes a giant leap at times and worries about pretty much everything. (I’m so trying to break that habit BTW. J) You hear about kids who were good kids but they make one mistake and their lives are irrevocably changed. That very idea gave me the beginning for this story. It was easy to imagine what my heroine Jillian might have been going through as a mother. Then I started to think about a hero for this story and what kind of person he might be. Since my background is in social work, I’ve always had a burning need to portray kids who’ve gone through the child welfare system in a positive light. My hero, Sam Carter, as a young child was shuffled from one foster home to the next. He’d be the first to admit he was no angel and got into trouble a lot. But what if someone came into his life that believed in him? Or as Sam calls Mama Iris, ‘the Mother Teresa of foster moms’. She gave him a chance and didn’t give up on him. Now, as a successful adult, he returns the favor to other kids in trouble. Below is a short except from when Jillian and Sam first meet. Somehow she’d managed to hold onto a sliver of fragile hope over the last couple of days, but now the enormity of the situation crushed her spirit. Surely she would go stark raving mad from the pressure. She tumbled into an open elevator and leaned against the back wall. Tears rolled down her cheeks and sobs hiccupped through her chest. Catching her breath seemed like a formidable task with depleting energy. Leave a comment about your favorite movie or book about the underdog who survives and triumphs despite obstacles for a chance to win a $10 Amazon gift card. She has written three books in the Hard Targets trilogy, Hard to Kill, Hard to Trust and Hard to Stop. In addition, she has a contemporary romance through Entangled Publishing called The Millionaire’s Deception, a self-pubbed Christmas short story called The Christmas Curse and two interracial romances, Fractured and Mama Said. Giveaway ends 11:59pm EST August 6th. Please supply your email in the post. You may use spaces or full text for security. (ex. jsmith at gmail dot com) If you do not wish to supply your email, or have trouble posting, please email maureen@justromanticsuspense.com with a subject title of JRS GIVEAWAY to be entered in the current giveaway. An unusual one is Thomas Harris book Hannibal Rising where as a child he is the underdog and survives. I'll admit I've only seen clips of The Silence of the Lambs. Too afraid it will be weeks before I'll be able to sleep. LOL. Didn't read Hannibal Rising, but it sounds like it shows a different side to him. I can't really think of one except for maybe Star Wars. t his book sounds quite intense. Star Wars is a good one, especially Luke. Accused is intense in spots. Lots of things going on for poor Jillian and her son, Travis. Ooo! I love the sound of ACCUSED. I just grabbed a copy from Amazon and look forward to reading it. When it comes to the underdog triumphing I can't help but think of Frodo from Lord of the Rings. I'm sure if I dwell on that thought a bit longer many more characters will come to mind (as that's one of my favorite themes) but off the top of my head, Frodo is definitely my first choice. Lord of the Rings is a great one. So glad Accused is your kind of book. I really hope you like it! Thanks for your comments this morning. Looking forward to all the responses. When I think of underdogs the first one that comes to mind is Rocky. When I saw your title, the first movie that came to mind was The Accused starring Jodi Foster. For much of that film, she wasn't even a very likable character. It left such a deep imprint I still remember the salient scenes vividly. Never saw that, but it sounds interesting. I will say EVER AFTER... it is a Cinderella type movie... I love that she is a strong character that is able to handle what has been thrown her way. The first that comes to mind are the LOTR books. Froddo had everything against him. Love that little Hobbit. Shane Falco in the movie, The Replacements. Actually, that whole team! Good one. It's been a while since I've seen that movie, but you're right, Shane and the whole team are underdogs! This book sounds really good! I love that kind of stories so I'm looking forward to reading it. As an example in romance I have Dillon Ward from "A Not-So-Perfect Past" by Beth Andrews. Jonetta, is the winner of the Amazon gift card. I'll contact you via email.